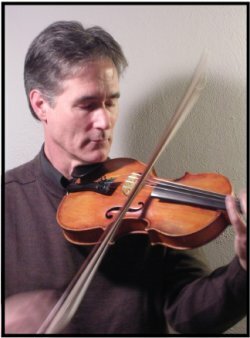 Dale Russ started playing the fiddle in 1973 when first moving to Washington State from his native Connecticut. Although self-taught – and 100% Slovak – In 1990 he was invited to perform at the first Boston College Irish Music Festival “My Love is in America” featuring 16 of the finest Irish fiddle players living in the States. The concert was recorded and released by Green Linnet Records and won an award from the Smithsonian Institute as “Traditional Recording of the Year”. His playing is known for its balance of power and elegance. Dale started instrumental music with 6 years of guitar playing before ever touching the fiddle. After hearing a Bluegrass fiddle player, he bought his first fiddle, mostly on a whim. Soon after, he heard Irish traditional music and never looked back. He was a founding member in 1977 of the Seattle Irish band “No Comhaile”, including members Mike Saunders, Mark Graham (later of “Open House” fame), fiddler Colin Manahan and Portland flute and whistle whiz Nick Voreas. After the bands unfortunate demise he continued working as a duo with Mike Saunders on guitar. During a brief residence in Portland, he met Kevin Burke, whose music had already had a huge influence on Northwest Irish music. In 1985 Kevin invited Dale and Tom Creegan to join Gerry O’Beirne and himself for a one-month gig at McGurk’s, the home of traditional Irish music in St Louis, Missouri. Around the same time, Mike and Dale added a third member for occasional gigs, stepdancer Sandy Silva, who also went on to join “Open House”. A few short years later, Dale was hoodwinked into joining the then-premiere Seattle Irish band “The Suffering Gaels” (for more info see “The Suffering Gaels: A History”). As a sidelight, Dale teamed up with Jack Gilder and Junji Shirota to record two CDs as “Jody’s Heaven”. It was with this band that Dale first visited Japan in 1996. He likes to revisit Japan at least once a year to compose himself and sample delectable dishes. Dale also joined with Finn and fellow Seattleite Hanz Araki in making two CDs as the trio “Setanta”, and one recording with piper Todd Denman titled “Reeds and Rosin”. He is also featured in the 1997 issue of Fiddler Magazine. This will be Dale’s second visit to the Winnipeg Irish Fest, the first visit a decade ago being very well received.